Only need a power generator for a limited time? For an event or construction site, USP&E towable generators can be rented and simply towed to the destined job or event site. Our portable generators easily provide light in a work area, or simply make a crowded event safer at night. When a disaster occurs, whether it be a hurricane, tornado, flood, earthquake, fire, or even just a bad storm, there's often no time to build a power station to provide needed power. Towable diesel generators can be operated on site, set up and running quickly, and provide power to buildings, data centers, hospitals, homes or emergency crews. 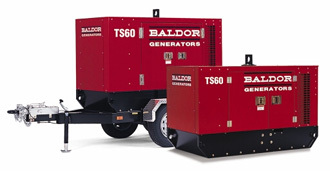 Our portable generators are powered by either gasoline or diesel fuel. Some model generators have fuel conversion kits that can be installed in order to convert these units to operate on propane (LPG) gas, or natural gas. Owners should be aware that installing these conversion kits should be completed only by an experienced and certified generator repair technician and, in some cases, a fuel conversion will void the original manufacturer's warranty for the power generator. Please consider these factors before pursuing. Call us today at +1-888-515-USPE and we would be glad to discuss your upcoming projects!